You are here: Home / Life Hacks / Cleaning Tips and Tricks / How to Get Pee Stains Out of a Mattress! Every day, somewhere in the world, a mattress gets peed on, soiled, or stained somehow. Urine stains and odors plague mattresses around the world, and you want to know how to get pee stains out of a mattress. Well, look no further, because this article tells you how to clean mattress stains, not only from urine, but from other types of stains common to mattresses. This post updates my original from March 30, 2012. Mattresses get a LOT of use and sometimes the inevitable happens: they get stained and smell horrible, especially if the accident involves urine. If you are a parent, I am sure you know getting the dirty bedding cleaned and back on the bed the same day does not always happen. In the case with my son, cleaning did not happen for three days. Everyone in our household was sick. I let my son sleep in our guest bed for a few nights, because his bedding was still nasty. When I pulled off his sheets to wash them, to my dismay I discovered he also peed on his brand new mattress. I was horrified and disgusted I failed to realize this earlier! I felt like a bad mom! The brownish yellow urine stain smelled awful. This upset me, because this mattress was high quality, expensive, and less than two months old. 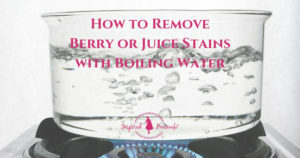 Here is the recipe to remove urine stains from a mattress, and many other types of stains also. It only takes 3 easy ingredients, but you also need a measuring cup, a tablespoon, a funnel, and a heavy duty spray bottle (read more about the type of spray bottle to use in the Tips section). If you do not have these items already, you can still get them for a fraction of the cost for professional stain removal. Instructions: Place the baking soda into the spray bottle using a funnel. Next add the 3% hydrogen peroxide, and finally add a drop of liquid hand dishwashing soap. I use Dawn® brand. Next, swish the bottle around gently. DO NOT SHAKE the bottle as this tends to clog the siphon straw. You must use this mixture relatively quickly, and it cannot be saved for later use. The recipe only works if you use it immediately, because the cleaning byproducts and chemical interactions remain active only for a short time. Also, the chemical reaction of all three ingredients combined can cause the mixture to ooze and leak out of the bottle, creating a mess if you leave the bottle sitting around. Spray the stained areas of your mattress thoroughly saturating them and let the mixture sit until it has dried. There is NO scrubbing and NO blotting. You literally spray and walk away. Wait for 5 to 10 minutes for the stain to lift and disappear. If this does not happen, you must apply the mixture again to ensure it fully cleans the the stained areas. Once the mattress dries, if a baking soda powdery film remains, then simply wipe it off with a damp cloth or vacuum it. This way to remove urine from a mattress is so simple and easy. I still jump for joy when I get to use this recipe! Here are my original photos of my son’s pee-stained mattress. The second image shows how well this recipe works to get urine stains out of a mattress. Most of my FAQs come from reader messages and comments. The discovery of which continues still. Spray bottle and clogging issues? MANY people have issues with their spray bottle, but I have done this application at least ten times without issues. I even used two different spray bottles, but here are some tips from me and readers to get you on your way to successful mattress cleaning. Make sure whatever spray bottle you have that the straw is as large as possible. Otherwise, the mixture is too thick and it will clog your spray bottle. Again, DO NOT SHAKE! It can definitely clog your spray bottle. Use the heaviest-duty spray bottle you can find. Remove the bottom siphon straw filter, if present. Do not shake the mixture, swirl gently instead. Will this work on a foam mattress? This method works on a foam mattress. Is Dawn® liquid dishwashing soap brand required? Nope! You do not have to use Dawn®; it is just what I usually have on hand. Use whatever you have in your kitchen as you only need one tiny drop! That drop acts to break down any oils that could be present as part of the stain. It seems like so little, but it plays an important role. It all depends on how much mixture you apply to your mattress or other stained surface. The room temperature and humidity can also have an effect on drying time. It took only a few hours for my stained area to dry when I cleaned my son’s mattress. I cleaned a urine stain from another mattress, and I used a box fan to speed up the drying process. The fan worked well. Does this work to remove pet urine stains and smell? NOTE: One caveat, this mixture works well for dog stains, but cat stains often present challenges, especially the lingering smell. After you get out urine stains, you can use an enzymatic cleaner for cat urine or other pet odors. Does this remove vomit or food stains? Does this recipe mixture work on old urine stains? Does this method work on skunk smell? Yes it does! This was actually confirmed on MythBusters. Have you ever had a dog get a little too friendly with a skunk? I remember when I was a little girl we had a dog named Sally who could not leave the skunks alone. I swear she thought it was a fabulous perfume. If only my parents knew about this recipe back then, lots of tomato juice would have been spared for better uses. Here is what one of my readers said about this recipe’s ability to de-skunk your pet. How does this work to clean suede leather? Yes, it should work fine. It is important, however, to test any surface in an inconspicuous area first before you apply it to the stained locations. The hydrogen peroxide works by breaking down proteins, and it can damage dyed leather. I would let it sit about 10 minutes and then use a clean rag to blot dry. I would then also use a leather conditioner after cleaning. How does this remove breast milk stains or infant formula? Yes, this method will clean breast milk stains or those from infant formula. Does it remove poo stains? Yes, this method can remove feces stains, but you must thoroughly remove the poop before applying the mixture. Will this work as a homemade carpet cleaner? Yes, this works to clean carpet. As a caveat, however, like I mentioned for leather furniture, or any upholstered furniture for that matter, test an area of the carpet in an inconspicuous before applying to the stain in a visible area. How does this work to remove blood stains? This mixture works well to remove blood stains. My husband who is a veterinarian, however, used straight hydrogen peroxide to remove blood from his scrub outfits after surgery. What about cleaning other stains like ink, dirt, coffee, or rust stains? Yes it can, but it depends on the type of stain and the surface. It is always worth a try! Does this clean cement or tile grout urine stains? Yes, some readers successfully used it to clean cement or grout stains. This method on how to get pee stains out of a mattress is simple, safe and works great! If your kids are like mine they usually also maintain an army of stuffed animals in bed with them. Here are my tips to wash the pee and grime safely off your stuffed animals and make them look and smell like new again. Do you have any other methods for how to get pee stains out of a mattress? Have you discovered other uses for this simple, but effective recipe? « What’s Your Word of the year for 2019? This is far easier for fabrics than the lemon trick I use for REALLY bad spots on hard surfaces, and even for a deep yet fairly gentle body exfoliant, a couple times a year – I cut a lemon in half, stick it in a sheer scarf, and for hard surfaces, sprinkle the surface with dry baking soda. Then I scrub over it with the lemon-rag & squeeze it whenever the bubbles stop. On skin, I just dip the lemon-rag in the baking soda, then scrub over wet skin. Remarkably effective, but takes a lot more work on something like a mattress! I’ll be using this in the future, and save the lemons for spa night, thanks! I have heard the lemon thing with salt for cutting boards, but never thought to use for hard surfaces. Great tips. Yes this has saved our mattress so many times. Even with covers somehow stains still appear and this makes them look new and smell better. Will there be any pee remaining in the bed o you think and if so, will it just evaporate over time?